Retail Products - PNY LH8000 PowerPack - Peak Development Ltd.
Power your Apple, Android or Windows smartphones and tablets in style. Is it a portable battery charger, or fashion accessory? It's both! The LH8000 is made from high quality materials to give a beautiful leather look and feel. Featuring a compact and lightweight design, it easily fits into your bag to provide instant power. Perfect for long flights, road trips, or whenever you need to charge your mobile devices. 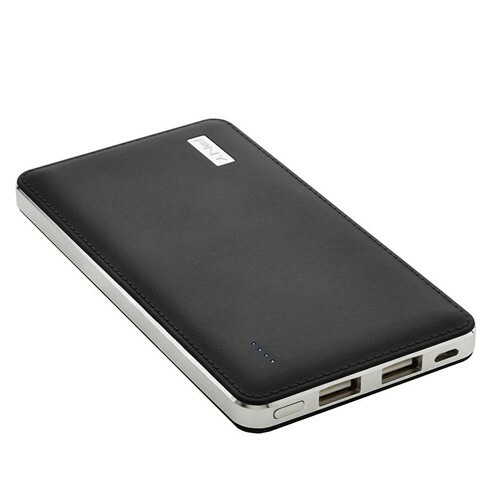 The 8000 mAh battery will charge any Apple®, Android™, Windows®, or BlackBerry® device. A fully charged LH8000 PowerPack can recharge most smartphones up to four times. The PowerPack comes with a Micro-USB cable for charging the PowerPack as well as Micro USB devices (Android, Windows Mobile, & BlackBerry)- if using an Apple device, use the included Micro USB cable to charge the PowerPack, but to charge your Apple device from the PowerPack, use your existing Apple charging cable. The PowerPack can easily be recharged from any USB port to keep you fully charged. LED indicators easily show how much battery remainins on the PowerPack. For your convenience the PowerPack comes charged and ready for use.